I met Jessica Swift at Quilt Market in Houston last October. She was showing her first fabric collection with Art Gallery Fabrics, and I knew right away it was one for me. The bright, true colors and cute illustrations are too much fun. When Jessica asked awhile back if I was interested in participating in the blog tour to promote the release of the fabrics, I didn’t hesitate to say “yes!”. 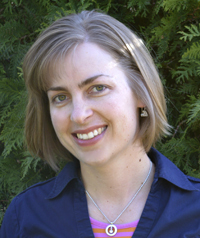 She is a such a sweet person, and I am so excited for her success and bringing her artwork to us quilters in fabric. You can find all the links for the Tallinn Fabrics Blog Tour, Here. Lots of inspirations out there if you are looking for ideas for these happy fabrics. When I started thinking about how to best showcase the Tallinn fabrics in my quilt, I knew that the pieces needed to be big so the large scale prints would shine. 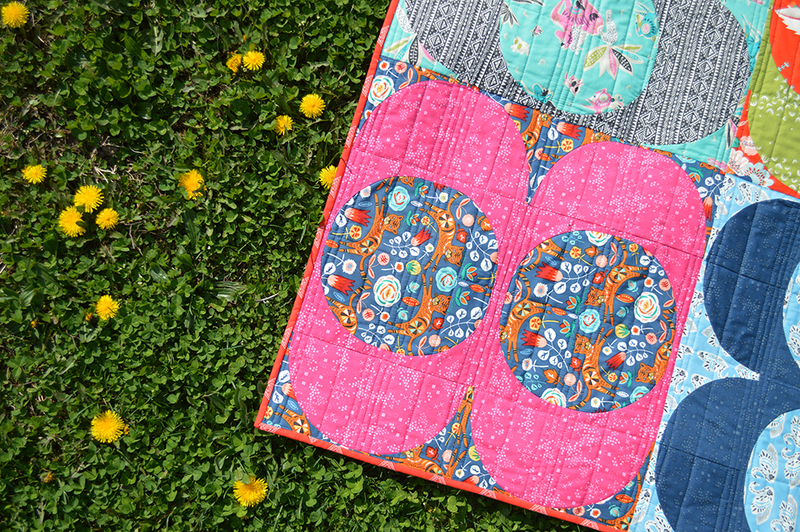 Since curvy quilts are the best kind of quilts, big circles won the day! 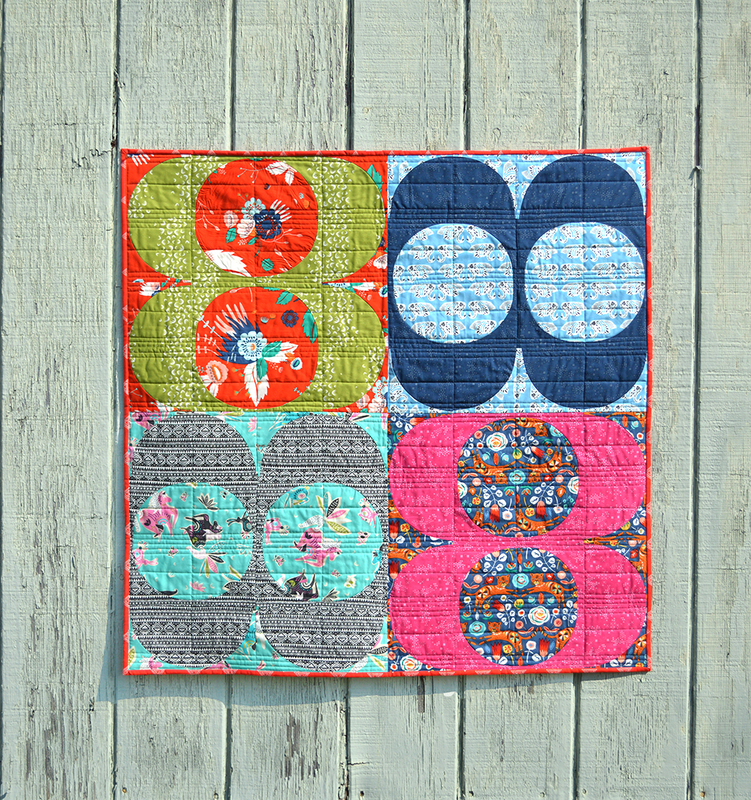 You can find the tutorial on how I sewed the full circle blocks, Here. They are pretty easy with the Classic Curves Ruler (-: and you can choose from ten size options for your block when you cut with the Ruler. It didn’t occur to me that the shapes I created with my blocks looked like the number 8 until a friend pointed it out to me (-: Eights or not, I’m digging this shape a lot…I’d like to see it in a larger quilt some day. For my little sample here, I used Hobbs wool batting, which is my current favorite for it’s light weight and easy-to-quilt thickness. I’m told that wool batting also keeps your quilts from developing creases when folded, so that’s a bonus! 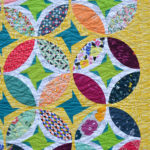 Quilting is straight lines with Aurifil 50 wt. and monofilament clear thread. One of the things I really appreciate about the Tallinn fabrics is that there is a great variety in the color and scale of the prints. 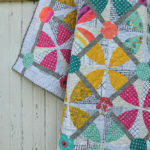 They coordinate, but not so much you need to add a lot to them to achieve the contrast you need for an effective quilt. 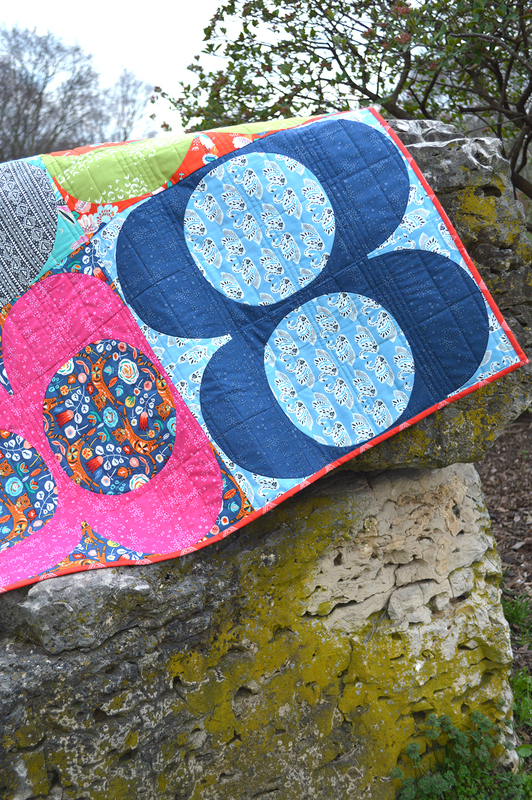 Be sure and look for Tallinn at your local quilting shop and visit the other bloggers to see all the projects. 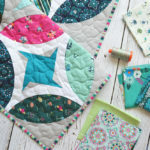 Be a Colorful Quilter and get the good stuff! sign up for email today.